Energy efficient MACRO-GLO refugium lighting is the intelligent option meant for sumps that will necessitate ultra powerful light output inside of a space-saving variety. The actual MACRO-GLO tightly clamps to the edge of your sump and can easily be placed out of the way meant for typical servicing minus the anxiety about dropping your light fixture within the water. These distinctive lamps equate to 5 times the lighting with standard incandescent lamps whilst making a reduced level of temperature along with lasting an awesome 8000 hours. 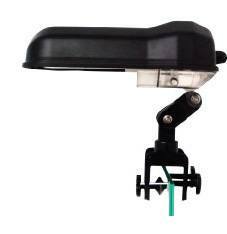 Each and every lamp fixture has a built in ballast and also fits the conventional medium based lamp fixture plug. The bulb is the only item that should be replaced! Your MACRO-GLO is on the market in 15 & 25 watt versions. They've been fitted having a 6400K Daylight to encourage macro algae within refugium environments. All versions include a parabolic reflector to optimize light strength and coverage. The MACRO-GLO can be tweaked at the head, arm, and base to suit your ideal application. This great, unique articulation allows countless configuration settings for any type of refugium. The clamp incorporates a spacer and makes it possible for three hundred sixty degrees rotation.